Click the button below to add the HP 1133 Plain & Simple Fitted T Redux to your wish list. Here’s the brand new, up-to-date and totally refined version of the most versatile top you’ll ever own. blend interlock, or even silk jersey. Semi-fitted T-shirt has deep hems at sleeve edges and hems, plus a self-fabric trimmed neckline. T-shirt features shaped center back and side seams for a feminine fit. Choose any combination of short, 3/4 or full length sleeves, and mix with your choice of boat, scoop or shallow ‘V’ neck for your perfect T.
For sizes 6-8-10-12-14-16 you’ll need around 1 1/4 yards / 1.15m fabric for the short sleeved version; 1 1/2 yards / 1.32m for the 3/4 sleeved version and 1 5/8 yards / 1.54m for the long sleeved version. For sizes 18-20-22-24-26 you’ll need around 1 3/4 yards/1.6m fabric for the short sleeved version; 2 yards / 1.82m for the 3/4 sleeved version and 2 1/4 yards/ 2.05 m for the long sleeved version. A perfect T and T pattern! Love this T-shirt! Like all Hot Patterns, this is printed on sturdy white paper. I do trace them to keep the original intact. I played with my muslin to try a couple new techniques, and this will be a great top to make as plain and simple or to embellish any way you wish. I will need to to do a small FBA next time around. 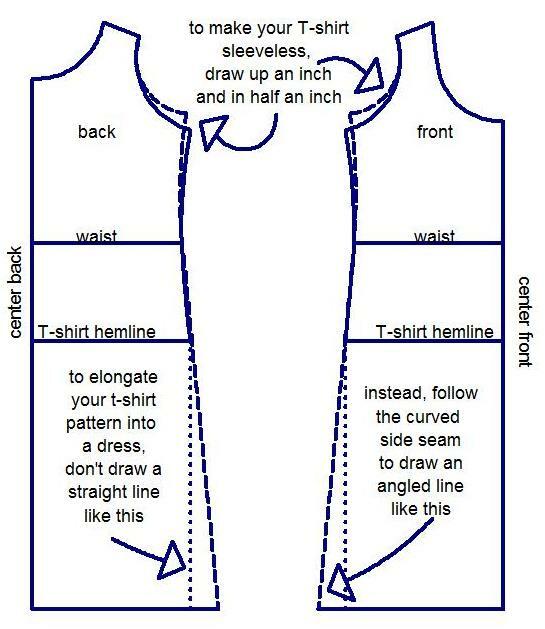 Like many Hot Patterns, Trudy has a great tutorial on lengthening the top into a dress. Win win! Best t shirt pattern !!! Let me start by saying Hot patterns are my favorite patterns ever! I have made several versions of this shirt, all the sleeve lengths and necklines are awesome! I know I will love and keep using this pattern for many shirts to come! Hot patterns is my favorite pattern company! I used this pattern and made the v neck as well as the boat neck and I LOVE them and plan to make many more versions of this t shirt! I am waiting on three patterns I ordered last week and I have no doubt they will be easy, fashionable, and quick to sew! Also I LOVE the videos! A gorgeous Tee that really is easy to make! The ordering process for this pattern was smooth and I received the pattern in the mail in a timely fashion. Did it look like the pattern envelope once you were done sewing with it? Yes. I made the scoop neck version. Yes, but honestly this top is so easy that you won't need them. I did notice the extra emphasis the instructions gave on the neckband needing to be shorter than the neck opening, so the neckband does not gape. They direct you to apply the neckband in what I think is one of the best ways to do it – so thumbs up on that! They also remind you that the length of the neckband will vary depending on the type of knit you are using. I used a regular sewing machine for all of the main construction of this top, and used a serger to finish the seams – but you don't need to have a serger or coverhem machine to sew from this pattern. Three inches to the length because I wanted it really long, but it would be *more* than long enough without alterations. I used the short sleeve and it was perfect. The length between the elbow marked on the sleeve pattern and the wrist for the long sleeve was about 6.5" which is not quite long enough for me. Since, I made a muslin I was able to confirm my suspicions ahead of time and decided to go with a short sleeve for my final top. The short sleeves were fine, look great and fit nicely. There is more of a sleeve cap than I expected but they are sewn in the flat and easy to do, and once again look really sharp when done. The shoulder width seems perfect. I made a muslin and although I have a pretty successful top, I will make further muslins to further tweak the fit and sleeves. Yes. I am pleased with my pretty new top. This pattern has lots of opportunity to personalize fit and I will definitely make it again.